Brian (Bri) and I both love Tory Burch Minnie Travel Flats. About a year ago I found Bri's blog and photos wearing Tory flats and decided to try a pair for myself. Bri is the poster "boy" for these. 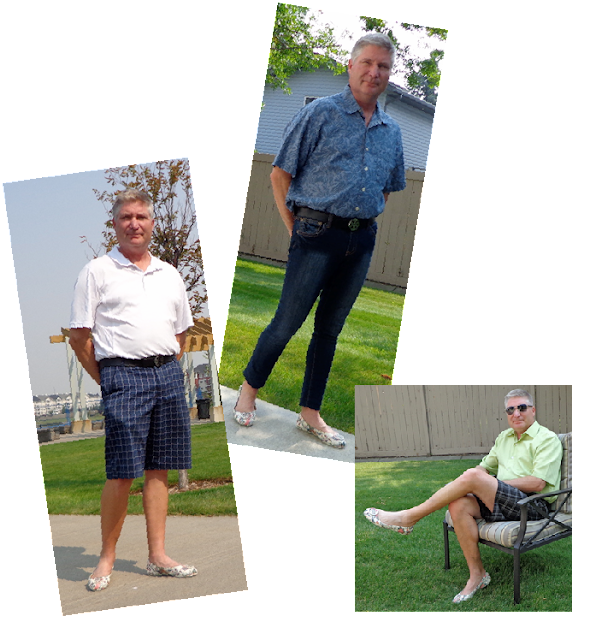 If you do not believe me, just Google "Men Wearing Ballet Flats". Back to Tory Minnie Flats. They are so comfortable and I keep a pair in my car at all times. Perfect with jeans. Just a few weeks ago I had been shopping on Worth Avenue and found nothing other than a Starbucks tea. So I pulled into my local mall on the way home. The sandals I was wearing were in the process of rubbing up a blister near my big toe because I had not worn them in while. (Sure, like you have never had that happen to you?) I put on my blue Tory Burch Minnie flats and was good to go. It was that very day, I purchased another pair of Tory Minnie flats at my Tory Burch mall store. The flats shown here. I could not wait to get home to write Bri about my wonderful find, thinking I had a pair that had not been added to Bri's collection yet - Silly me. Here is the note back with photos; enjoy. Thanks for sharing Bri. I'm wearing mine as I'm type this message to you, hehe. Before I ever saw these on the Tory website I was thinking to myself I didn't have a pair of floral flats. Careful what you wish for RIGHT! I have some pretty feminine looking flats but the floral pattern on these SCREAMS FEMININE. A few of my female Tory friends have said they would never buy them cuz they are too feminine looking. I guess that make them perfect for us. The times I have worn them I have received very nice comments about them but they were from friends that know my tendencies. I can only imagine there's been a few people think to themselves, What The ???. I always think of you and just enjoy my Escape. Cute shoes and really nice legs! As always Rhonda, thank you for including me a sharing me in your post. I hope you are still loving your super cute floral flats. I love mine. I just wished I lived in a climate like you so I could wear them all year round.